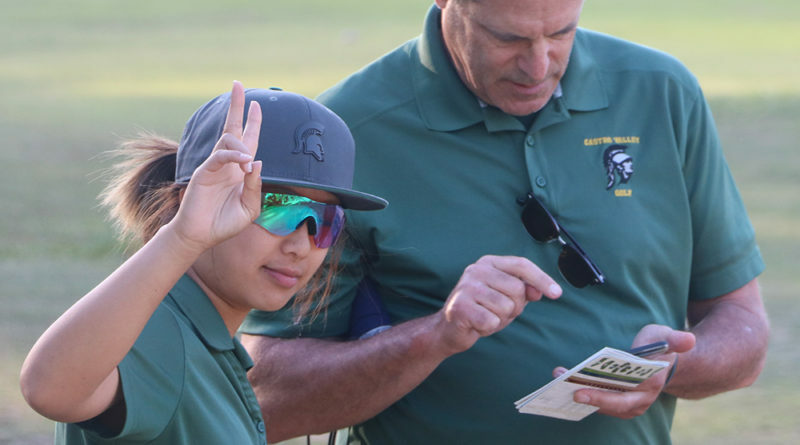 Senior Tara Ng is "the shortest and smallest but has the biggest heart" on the Trojan girls golf team. Trojan girls golfers may act childishly at times but can surprise you with their extreme talent, placing them second in their league. Every player can agree that Tara Ng, the one and only senior and top ranked player at CVHS, is keeping the team not only mature, but also on the right course. Ng competed in the D2 NCS qualifiers as an individual in her freshman year, D1 NCS qualifiers as a team in sophomore year, and D1 NCS qualifiers as an individual the last two years. “She’s the shortest and smallest but has the biggest heart,” said her teammate and sister Tani Ng. The biggest heart comes from her radiant personality and immense skill, as the team naturally accepts Ng as the leader. “She plays well not just for herself but for everyone on the team, and she motivates us all to be better,” said junior Annika Huston. What’s most impressive of her athletic achievement is that golf was never her main sport, and although Ng picked up a plastic club at age one, she did not join a golf team until middle school. Through experience with other sports, Ng learned to deal with the ups and downs of athletics. “I always get frustrated with every aspect of it, but being on the course is relaxing even though it’s difficult because you’re not always hitting good shots. I’d say it’s unpredictable and it’s different every single time, but I really like playing,” she said. “The leap from high school to college is huge but she’s definitely on the right track… She doesn’t even know yet how exciting it’ll be!” said coach Darrell Lavin.